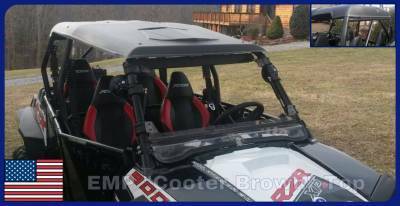 RZR-4 “Cooter Brown” Polyethylene Top Fits: 2010-2014 RZR-4 and RZR XP900-4 Will not fit the Jagged X Edition because the cage is different from the standard RZR-4. P/N: 12457 Thermoformed from 3/16” Thick Polyethylene (thickness may vary after forming). Protects all the way to the sides protecting your shoulders from the rain and sun. Ships UPS to your door. Adds style and function to your RZR-4. Laser Cut Logo plate. Ships in two pieces and bolts together at assembly. Gasketed between the two halves. Includes: Rubber Coated Mounting Straps. Made in Cleveland Ohio. Add style and function to your RZR-4 with this “Cooter Brown” top. Unlike other tops on the market this top extends all the way to the sides protecting your shoulders from the rain etc. The top ships in two pieces and bolts together at assembly. Rubber coated mounting straps will not scratch your cage. Made from rugged 3/16” Thick Polyethylene (not ABS like other tops) making it very durable. Polyethylene is the same material used to make ATV fenders.